Summary: No precipitation throughout the week, with high temperatures bottoming out at 59° on Tuesday. 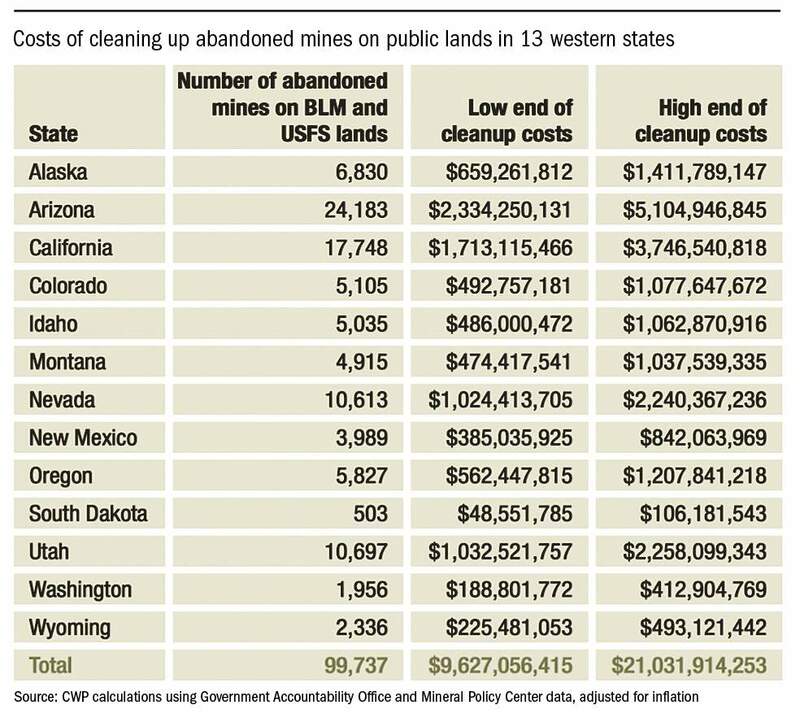 This analysis from the Center for Western Priorities shows the exorbitant costs to clean up the thousands of abandoned and/or inactive mines on public lands across the West. A conservation advocacy group recently determined it would cost about $21 billion to clean up the approximately 100,000 abandoned mines across 13 Western states, but what the study truly aims to highlight is the burden of cost for remediation and who should lead the cleanup. On Wednesday, the Center for Western Priorities released an analysis it conducted that found the exorbitant price tag for the thousands of abandoned and/or inactive mines throughout national public lands across the West, based on estimates of previous hazardous waste remediation projects. In Colorado, the study claims it would cost up to $1 billion to properly address the 5,105 mines leaking acid mine drainage into national waterways, affecting water quality for aquatic habitats, recreation and in some cases, human health. But researchers of the study want to not only point out the staggering amount of money it would cost to remediate a history of wildly unregulated mining practices, they also want to discredit a growing contingency of anti-government elected officials and organizations that want to see federal land put back in the hands of the states. “These numbers ought to be a wake-up call to politicians who falsely claim that states could afford to take over the management of our national lands,” CWP advocacy director Jessica Goad said in a statement. The pushback from Westerners on federal involvement is no new concept. Duane Smith, a former Fort Lewis College professor and historian, said tensions date back to the 1820s, as people settled the frontier. Now, the state vs. federal debate about land rights has hit closer to Durango since the Aug. 5 Gold King Mine blowout, when the EPA triggered 3 million gallons of orange mine wastewater to empty down the Animas River and into New Mexico and Utah, while leading a cleanup effort on an adjacent mine about 10 miles north of Silverton. “This mistake and lack of transparency by the federal EPA is yet another egregious example of why states and local entities are much better managers of our own land and natural resources,” Utah state Sen. Margaret Dayton said in the wake of the spill. Matt Anderson, director of the Coalition for Self-Government in the West at the Southerland Institute, said the study completely detracts from the real issue of land management. Here in Colorado, local and state officials have not taken the same hardline stance as in Utah. While there was no lack of admonishments for the EPA’s role in the spill, the majority of Southwest Colorado representatives have acquiesced that it’s going to take federal dollars to improve the water quality in the Animas watershed. Brian Burke, an FLC professor of psychology, said it’s important to take a step back when analyzing the growing distrust of the federal government. While the issue is about land rights, he said, there’s a lot more that goes into decisions than rational thinking. Regardless, both the San Juan County Commission and Silverton Town Council voted last week to pursue negotiations with the EPA for mine cleanup, though officials there hope the state’s health department will lead the project. La Plata County’s and Durango’s elected officials are slated to do the same. Ultimately, local constituents will have to ask Gov. John Hickenlooper to send a letter to the EPA requesting to be placed on the National Priorities List.